"A bird of the night side of the woods..."
In September, 1851, Henry David Thoreau wrote: "The Whip-poor-wills now begin to sing in earnest about half an hour before sunrise, as if making haste to improve the short time that is left them. As far as my observation goes, they sing for several hours in the early part of the night . . . then sing again just before sunrise. ... It is a bird not only of the woods, but of the night side of the woods." Clearly and continuously, the bird announces its name [Whip-poor-will song]. 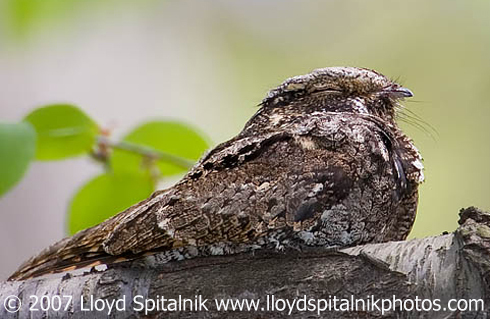 In summer to early fall, Eastern Whip-poor-wills breed in woodlands of eastern North America. Their camouflaged plumage blends seamlessly with dead leaves on the forest floor. At dawn and dusk and all through moonlit nights, whip-poor-wills sally out from tree branches to hawk flying insects. Bird sounds provided by The Macaulay Library at the Cornell Lab of Ornithology, Ithaca, New York. Recorded by W.L. Hershberger.